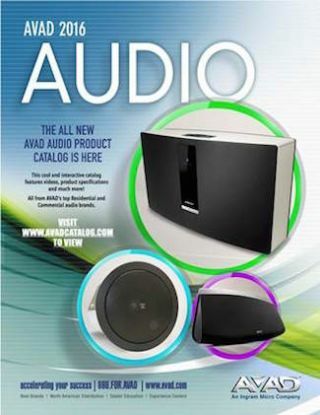 AVAD has launched a new Interactive Catalog for audio products. The Audio Edition allows dealers to access videos, spec sheets, tools and other product information through computers, tablets and mobile devices. The catalog lists extensive details from audio manufacturers such as Artison, AKG, Bose, Crown by Harman, DBX Professional Products, Denon, HEOS by Denon, JBL Professional, Marantz, MartinLogan, Niles, Parasound, Polk, Sonus Faber, Soundcraft, Stealth Acoustics, Sumiko and Sunfire. The catalog includes a large amount of audio and video components for dealers to pair solutions for any need, ranging from a commercial office or hospital to a residential home or hotel. To view the catalogs, visit the webpage.